Dressing to go horseback riding doesn't have to be expensive, and appropriate garments are not difficult to find. Although you will be able to find comfortable and suitable clothing in the consignment section of your local tack shop, your helmet is an item you don’t want to skimp on. This is the one piece of equipment you will want to buy brand new. A used helmet might have unseen damage to the inner linings and won’t provide the necessary protection. There are lots of different name brands of helmets that come in many different styles and colors. Helmets come in English and Western styles as well as sporty sleek models for hacking and schooling. Choose a helmet that is attractive, comfortable, and suitable for the type of riding you are doing. Most importantly, choose a helmet that is labeled ASTM/SEI certified. ASTM stands for American Society for Testing and Materials. The SEI certification means that the helmet has been constructed specifically for horse sports, and the materials and design have been tested and inspected. Helmets designed for other sports such as cycling, skiing, or rock climbing may not provide adequate protection for a fall from a horse. Take your time making sure the helmet fits. Nod and shake your head; the helmet should remain level and secure. The harness should be adjustable and comfortable. Plan to spend more than $50 on a good quality helmet, and if your whole family rides, each member will need a helmet that fits them properly. Unless you plan to go to a horse show, you probably have a suitable shirt, such as a T-shirt or sweatshirt, to wear. If you are going out on the trail, you might consider wearing bright colors for visibility. Many riders like to wear vests when the weather gets cooler. Your arms and shoulders are less restricted in a vest, and they lend themselves to layering for warmth. There are winter coats designed for riding if you live in an area where you have to cope with frigid temperatures. These coats are roomy through the shoulders and have gussets so they spread over the saddle rather than tucking under your seat. Many have attractive reflective tape and patches for greater visibility out on the trail. Add a warm helmet cover and winter riding gloves to make winter riding more comfortable. If you do plan to show your horse, you’ll need appropriate garments. Head out to some horse shows to see what others are wearing. Often, you will need very specific types of clothing. Show clothing can be custom made, bought off of the rack, home sewn, or purchased used in the consignment section of tack shops. For everyday riding, an inexpensive pair of two-way stretch tights may be the most comfortable thing to get. Riding tights can be bought with leather knee and seat patches. These provide a bit more grip and will be made of a more durable fabric than tights not designed for horseback riding. Winter riding pants are made of fleece material for warmth. Many people ride in jeans or sweatpants. What you will want to avoid is pants that twist, wrinkle, or bunch along the inside of your legs, and especially knees. Some people like the extra grip, and in the winter the wind breaking ability of leather riding chaps. 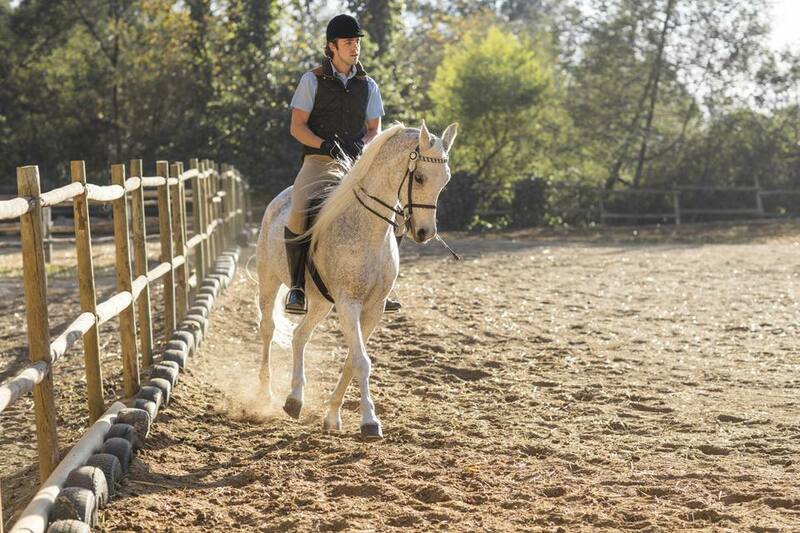 Half chaps that cover from knee to foot provide grip and protection for the lower leg. You’ll need jodhpurs, breeches, or other traditional riding pants if you are headed for the show ring. Plan to pay $50 or more for a pair of riding tights and more for jodhpurs or breeches. You can save money by sewing them yourself or buying lightly used ones. Next to a helmet, your boots may be your most important purchase. Although there is no official testing or standards for boots, you will want to find a pair with about a 1 to 1 1/2 inch heel and low tread. The tread on many hiking and winter boots is too heavy and, in case of a fall, may jam in the stirrup. There are many different styles of boots, so choose whatever is comfortable, affordable, and suitable for the riding you do. Your boots don’t have to be ‘riding boots’ as long as the sole and heel are appropriate. Inexpensive leather and running shoe style riding boots start at about $100. The consignment corner at tack shops is usually burgeoning with lightly used leather and rubber riding boots great for riders on a budget. Sometimes it is possible to find suitable boots at thrift stores, or there may be something in the back of your closet that would work. If you are involved in other sports, you may already have suitable undergarments including sports bras. Tack shops often carry a selection of bras and underwear designed for riding. Shops that specialize in jogging and running gear are also places to look for comfortable undergarments. What Clothes and Tack Do You Need for Your First Western Horse Show?